But here I am! Sneaking a blog post at work. I keep talking about this Hillary/Obama thing. I can’t take it. We need to pick a candidate – and I want them both to win. I do. But here’s the thing — Hillary is smarter that Obama, and she is pretty in person. She’s not the monster that the press make her out to be. She’s tough and she does her best to hide it, because she’s a woman. A politician needs to be tough — and Hillary has to apologize for being smart and cut throat because she’s a woman. It really bugs me. I’m sorry, but I can’t just jump on board to Obama’s train. He says the same thing over and over. Where’s the substance? 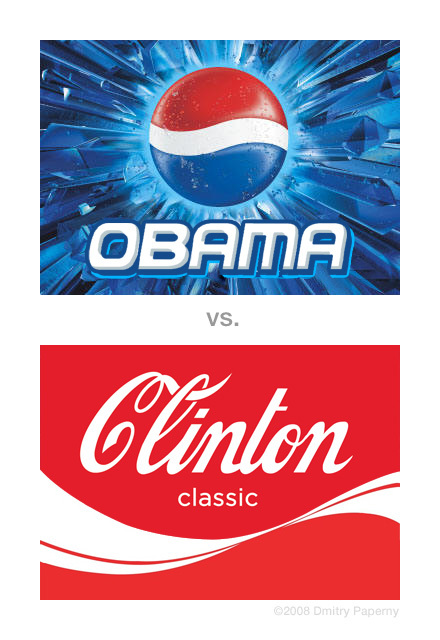 My husband, who says I shouldn’t blog, likened the candidates to Coke and Pepsi drinkers. I don’t drink soda anymore, but if I did, I would drink Coke.